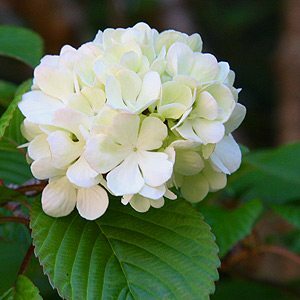 Viburnum plicatum is known as the ‘Japanese snowball tree’ and is native to Japan, Chine, Korea and Taiwan and is used widely as a feature plant in the garden border, however lots of different forms and cultivars exist. Generally fairly slow growing. Viburnum plicatum ‘Grandiflorum’ (picture right) is a species that produces large “snowball” flowers, a stunning display in spring, like all this one can easily be pruned back to maintain size and create a more bushy effect. habit, attractive deep green foliage and covered in tiers of laced white flowers from mid to late spring. In autumn the foliage turns a nice purple before dropping. Try a position at the back of the border or as a dividing plant at the front of the border, V. plcatum ‘Lanarth’ will reach around 4m. Pruning is minimal as these plants seen to develop a naturally pleasing shape, remove old dead wood or damaged matter. Prune lightly after flowering to keep in shape or hard prune in winter to reshape. Some protection from hot afternoon sun is required, a humus rich well drained but moist soil.